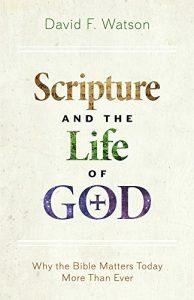 “The Bible isn’t just a book of statements about God; it is a pathway into God’s very life,” writes Dr. David Watson in his new book The Life of God: Why the Bible Matters Today More than Ever (Seedbed). Watson, Academic Dean and Vice President for Academic Affairs and Associate Professor of New Testament at United Theological Seminary (Dayton, Ohio), answered some of our questions about his new work. Right up front, in your “Acknowledgements,” you note that your wife and your parents read all or much of the book and gave you feedback. What’s it like getting reaction from such close family members? What are their backgrounds? My parents have been United Methodists since before I was born. My wife, Harriet, who is English, was raised in the Anglican Church (in John Stott’s congregation no less). They all have unique perspectives as Christian laypeople. Sometimes we who live in the seminary world have a hard time speaking to people outside of it. As in any community, we have our own jargon and we assume people understand it. This book, though, was written for a broad audience. My wife and parents, along with one of my co-workers, Phyllis Ennist, helped to assure that I was writing in a way that people outside of the seminary community could follow. Over the years, Harriet in particular has helped me to become a better communicator, and she knows it doesn’t help me if she pulls her punches. I have to admit, back in my grad school days, I really wasn’t very good at communicating with folks outside of the academy. It takes skill, practice, and intentionality to engage with people outside of your primary community, and she has helped me to develop that craft. When I was a grad student at SMU, Billy Abraham invited me to be a part of an academic seminar that would develop what came to be called “Canonical Theism.” We met to talk about what it would mean for the body of Christ (especially Protestants) to develop a deeper appreciation of the spiritual resources passed down to us by our fathers and mothers in the faith. Our liturgy, the great teachers who have gone before us, the sacraments, our creeds, and, yes, Scripture, all work together as means of grace to lead people into the life of God. In other words, through the church God has provided us with ways to enter into the divine love between the Father, Son, and Holy Spirit. Scripture and the Life of God takes up this idea and applies it particularly to the Bible. We don’t just read Scripture for information. We read it for transformation. Through it we encounter the living God, and we are thereby changed. I want to make this idea accessible to people in Wesleyan congregations. Speaking for my own tradition, The United Methodist Church, we have by and large lost a sense of Scripture’s power to shape our lives in the image of Christ. We don’t have a clear sense of Scripture’s inspiration, and thus we have lost a strong sense of its authority. When we come across passages in the Bible that we don’t like or which challenge us, we simply ignore them or chalk them up to an “ancient worldview.” We need to engage Scripture—the whole of Scripture—and learn to wrestle with difficult texts rather than effectively cutting them out of the Bible. Part of my motivation for writing this book was evangelistic. I want people, both “churched” and “unchurched,” to encounter the living God in the pages of our sacred text. I want people to know the God who came to us in Jesus Christ, and Scripture is among our most powerful resources for facilitating this encounter. Yet our posture toward Scripture matters. One can read the Bible and never encounter the living God. Our approach makes a difference. I want to honor Christ by teaching people how to come into deeper relationship with him. I want people to understand how much our sacred text has to offer, how powerfully God can work through it to change their lives. When did you sense a call to ministry, and to the ministry of teaching in particular? I felt a call to ministry for as long as I can remember. For much of my life I didn’t know that’s what I was feeling, but I knew I wanted to serve God through my vocation. My last year of college I began to get some clarity, which was surprising because I wasn’t walking closely with God at that time. Still, I entered seminary at Perkins, and shortly thereafter I began to see that I was called to ministry in an academic setting. Who/what are you reading these days? I recently read The Band Meeting by Kevin Watson and Scott Kisker, which was really convicting. Otherwise I’ve immersed myself in reading out of the charismatic movement lately. I just finished an advance copy of a book called Spiritual Gifts Handbook by Randy Clark and Mary Healy, who is a Roman Catholic biblical scholar. It should be out in March. It’s one of the most interesting things I’ve read in some time. I think my next book will be on the Holy Spirit. I’m not sure how I’m going to approach the topic yet, but it will likely be an exploration of key biblical texts on the Holy Spirit with commentary on their application within the life of the church today. I have several other books that I want to write, including an academic piece on a Wesleyan doctrine of Scripture. So many books, so little time….